What is the MODE.SNGL Function? 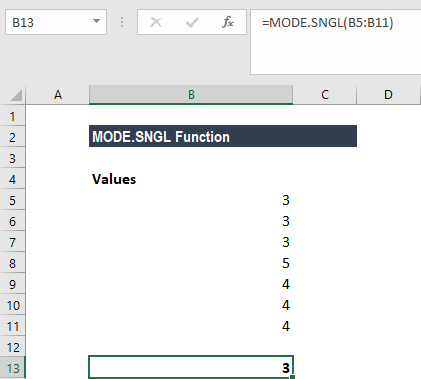 The MODE.SNGL Function is categorized under Statistical functionsFunctionsList of the most important Excel functions for financial analysts. This cheat sheet covers 100s of functions that are critical to know as an Excel analyst. It will return the most frequently occurring number in a numeric data set. The function was introduced in MS Excel 2010 and is unavailable in earlier versions. As a financial analystFinancial Analyst Job DescriptionSee a real Financial Analyst Job Description including all the skills, experience, and education required to be the successful candidate for the job. Perform financial forecasting, reporting, and operational metrics tracking, analyze financial data, create financial models, MODE.SNGL can be used to find out the most frequently occurring numbers in a data set. Suppose we wish to know the highest number of sales returns in the first quarter for the last five years, we can use the function to find the figures. MODE.SNGL is different from MODE.MULT function as the MODE.SNGL function returns the lowest mode, whereas the MODE.MULT function returns an array of all the modes. Number1 (required argument) – The first number for which we want to calculate the mode. Number2 (optional argument) – Number arguments between 2 to 254 for which we wish to calculate the mode. We can use a single array or a reference to an array instead of arguments separated by commas. The function will return a single numerical value. 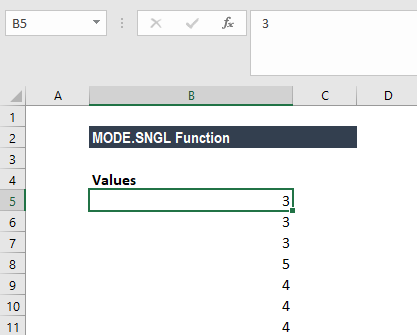 How to use the MODE.SNGL Function in Excel? 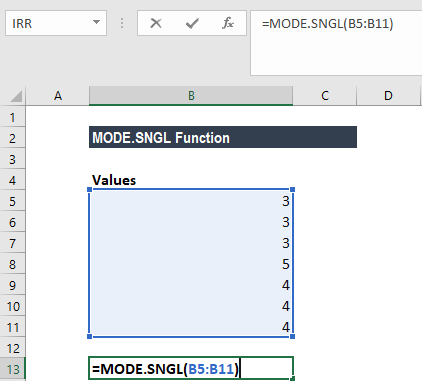 Remember in the MODE.SNGL function, if there are 2 or more most frequently occurring values in the supplied data, then it will return the lowest of the values. #N/A! error – Occurs when there are no duplicates in the values provided. #VALUE! error – Occurs when the value provided to the function is non-numeric. Non-numeric functions that are part of an array of values are ignored by the MODE.SNGL function. If an array or reference argument contains text, logical values, or empty cells, the values are ignored; however, cells with the value zero are included. The MODE.SNGL function measures central tendency, which is the location of the center of a group of numbers in a statistical distribution.